We have heard this story before. The Importer of “Fill in the Blank” manufacturer goes to the bosses as “Fill in the Blank” and tells them he needs a better product. The bosses at “Fill in the Blank” take one of their current production bikes, add some (power, displacement, fancy color), give it a new name, ship it to said Importer, and a legend is born. 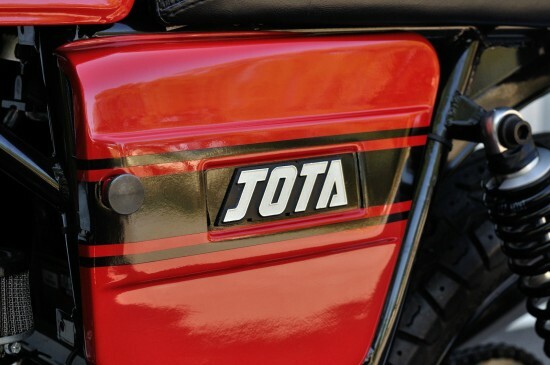 In this story, Fill in the Blank is Lavarda, the British importer was Roger Slater, the production bike is the 3C, and the new Legend is this 1977 Lavarda Jota. This bike was set up to race but never got the chance at Riverside in the 80’s (AMA changed the requirements) so I am told by the previous owner. The bike was completely disassembled and modified slightly. If you look close on the pictures you will notice the frame was reinforced in the air filter area. No longer can the original air box be installed. 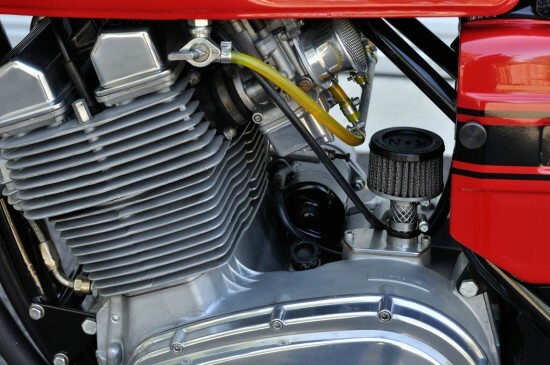 If you look close at the exhaust down tubes you will see another reinforced cross tube unnatural for a Laverda. These mods stabilize the bike at higher speeds evidently. There are custom made foot levers for the gear shifting and the brake, one off pieces. The rear disc brake you can see was also modified in an upside down nature. One off parts to accommodate the mounting. All the modifications are done with forethought and implementation. The powder coating on the frame, wheels, and fork sliders is very thick and shiny. Best I have ever observed. Actually unusual in a good way. 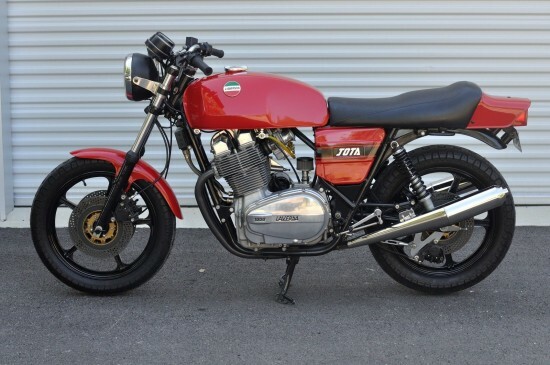 This bike sounds incredible, idles perfectly, and runs like a Jota should. Handles beautifully. It is robust and throaty. The paint is excellent. One imperfection on the back tail piece. This is a hair line crack emanating along the mounting screw. Probably overtightened at one point. Tires are in good shape. 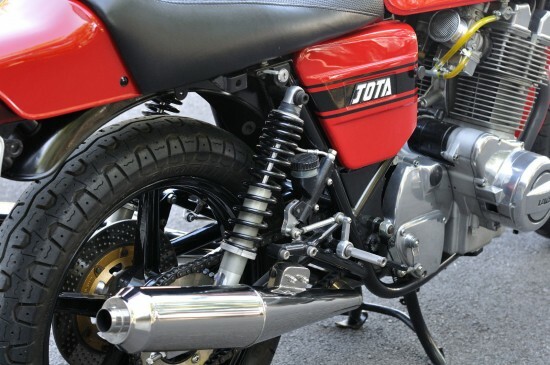 From the factory the Jota came as a 3 cylinder, DOHC engine displacing 981cc. It was fed fuel through 3 32mm Dell’orto. This produced a published 97hp at 7000 rpm and a top speed of 131 mph. Stopping was done with a pair of twin disk up front with 2 pistons per disk, a single disk out rear. With the modifications that the seller listes above, I would guess all these factory numbers have be surpassed. 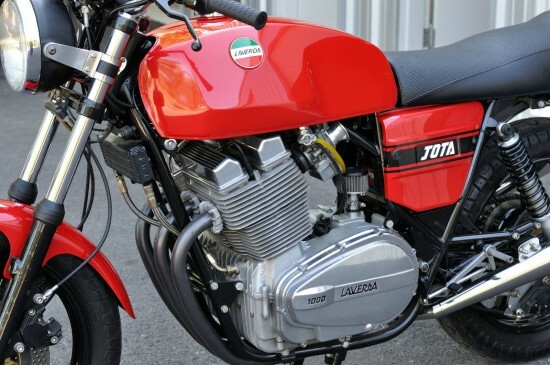 This is a July 1977 Laverda Jota. This particular bike was originally sold in Southern California. I bought it a couple years ago and thought I would put it to use here it Texas…..Now for what is not there. There are no turn signals, and the wonderful Vox bell horns are not there either. So, most likely you have to call or email Wolfgang Haerter in Canada to procure the parts. This might be my favorite bike in the world. In my opinion, it’s got it all, looks, performance, and has one of the best sounding exhausts out there. Can I sell any of my body parts on e-bay? Seems I remember this Jota for sale on ebay about this time last year. This is an amazing Jota that leaves a lasting impression.